ESTONIE – Salme - Among the latest finds at the ancient ship burial site in Salme, Saaremaa, archaeologists have discovered a well-preserved double-edged sword. 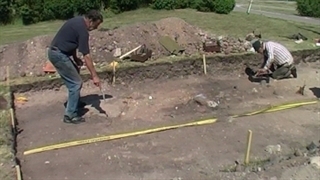 “We have discovered typical Salme materials from here, such as swords, rivets, arrowheads, a sheath for a whetstone, and a bunch of modern trash that has been mixed in with the ship's materials,” Ragnar Saag, a master's student of the University of Tartu who led Tuesday's excavation, told ERR radio. "I think the most double-edged sword is probably the most remarkable artifact that we have found. It is in one piece with a hilt intact, and it provides for good research,” Saag said. The sword was still partially buried on Tuesday morning, but Saag said he expected to finish digging it out by the evening. Fragments from four other swords have also been found. Experts also found shields, which they believe were used to cover the entire boat grave. Archaeologists have found dog bones with signs that the dogs were killed before they were buried with their masters. Several warships have been found in the island village, the oldest dating back to the year 750. 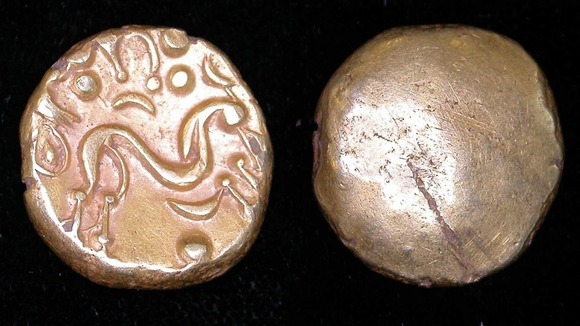 ROYAUME UNI – - Peatling Magna - A man from Leicestershire has stumbled across a set of 2,000 year old coins, which will be unveiled at the start of the county's two week archaeology festival. 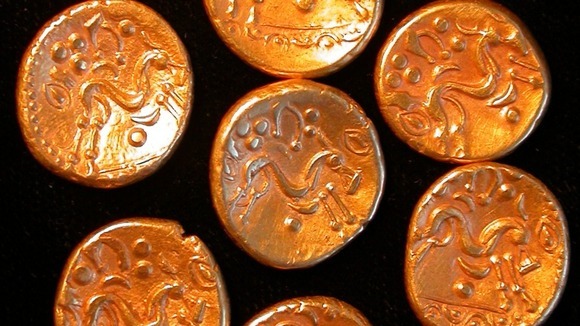 The ten gold coins were discovered in Peatling Magna by Steve Bestwick. It is thought that they were made in Northern France, between 60-50 BC, suggesting that people living in Leicestershire had contact with their French counterparts. According to Wendy Scott, Finds Liaison Officer at the county council, coins are rare so far North, meaning their discovery carries much significance. 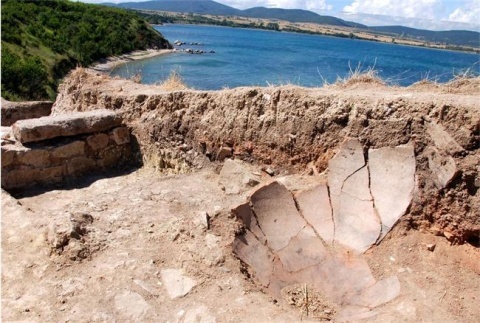 BULGARIE – Akra - A Bulgarian Herculaneum, named Akra, has been discovered by archaeologists on the Akin cape, near the town of Chernomorets on the southern Black Sea coast. The settlement had been destroyed by an Avar invasion. Ivan Hristov, who leads the archaeological team and is a Deputy of Dimitrov, is continuing excavations on the cape, where a unique for the Bulgarian Black Sea coast underwater district with remnants from an early Byzantine fortress have been found. The fortress, initially believed to be named Krimna, dates from the end of the 5th century A.C. According to Hristov, the fire set by the Avars, in some way sealed the finds into the earth, similarly to the lava from Vesuvius sealing Pompeii. The heavy tile roofs collapsed preserving everything underneath. Dimitrov told 24 Chassa that the finds included several fully preserved vessels, clay amphorae, lamps, gorgeous tiny glass cups, along with a number of ceramic fragments, which will be restored. The items were made at the time by craftsmen in northern Africa and then taken to Akin by ships. The NIM Director further reiterates that after taking a thorough look at the finds and digging deeply into archives, he realized that this has been a city very similar to the Italian Herculaneum in the way it has been preserved, and that he was inclined to change his initial belief the city was named Krimna. "Most likely it was the same as now – Akra. In ancient Greek Akra means cape but also a fortress and a citadel. Many historical documents confirm it; there was such large city," says he. The team is currently working in the southern part of the fortress, where, as Hristov reports, a large number of finds had been discovered in a small area because the construction had been very dense. "We are studying now a third house and we see already something like a residential district behind the fortress walls, with large homes with stone foundations," the archaeologist explains. The team has also found four large bronze coins with the portrait of Emperor Justinian the Great, showing that the fortress was built during the reign of Emperor Anastasius about year 513, and was later reinforced by Justinian. USA – Hilton Head Island - A team from University of South Carolina excavated the remains of an sunken ship Friday on the beach on Hilton Head Island. 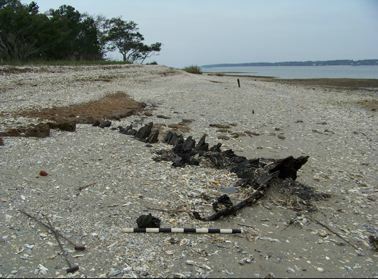 The team of maritime archaeologists is training students how to excavate and record the remains of an abandoned wooden vessel that was reported to state archaeologists in late 2010. The crew is using sections of the vessel that was beached near the Harbor Town Golf Links and has a 10-foot portion that is exposed above water. The vessel is believed to have been from the Civil War era and has not yet been explored by archaeologists. The students are adult scuba divers taking a four-day Sport Diver Archaeology Management Program course at USC. The participants were taught how to find out what type of vessel it is, how old it is, why it was abandoned, and where it was built. Archaeologists planned to sandbag and reburry the the vessek after excavation to protect it from future deterioration. ROYAUME UNI – Scapa Flow - The seabed of Scapa Flow is a shipwreck graveyard – an underwater maritime museum – with wrecks from the two World Wars. The former naval base in Orkney was the scene of the largest intentional sinking in seafaring history when, in 1919, a German fleet scuttled 74 ships at the end of the First World War to prevent them from falling into British hands. 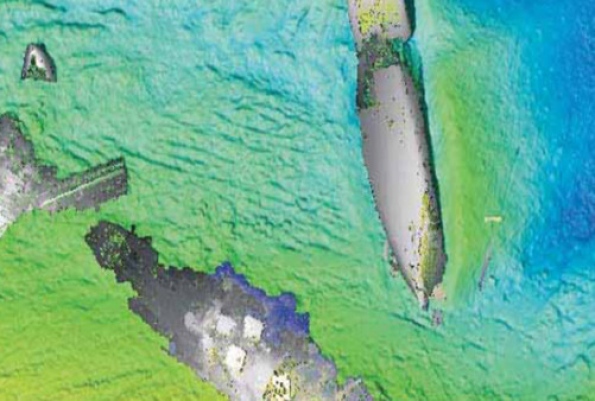 Now, a remarkable new sub-sea survey has mapped 18 sites revealing previously unseen detail of wreckage and contributing valuable information about Scapa Flow’s immense history. Unprecedented detail has been found on merchant ships from both the First and Second World Wars, a German submarine, and a trawler used to operate boom defences at the entrance to Scapa Flow. The results, which have been posted online, were derived from high resolution sonar surveys on the sea bed.